Today marks FOUR years from THE FLOOD. It marks the day that our nightmare was to be finished and we were to be made whole again. And although some may be aware that we finally sold the flooded property to the government to be forever green space, the nightmare is not over for so many of our neighbors. By law, today is THE DAY that our homes were supposed to be flood code compliant. That meant that it was to be bulldozed, lifted onto stilts, or moved to higher ground. Many of our neighbors and friends are still waiting for the help that was promised and has been very late to arrive. We are in a different spot that our neighbors. We hadn’t been in Lisle for our entire lives. We were just starting to put down roots. Of course it was unimaginably hard to lose everything we owned. But we weren’t also at odds with a community we had been in since birth. It’s so bittersweet for many of our friends. They want to be able to stay in Lisle. But perhaps with their buyout offer, the current housing market is not being flexible enough for them to get the type of house they need. So many people MUST leave Lisle. We CHOSE to leave. Although through the flood we met many wonderful people, those roots weren’t as strong for us. We wanted to put a little distance between us and the town that stole the first four years of our marriage. 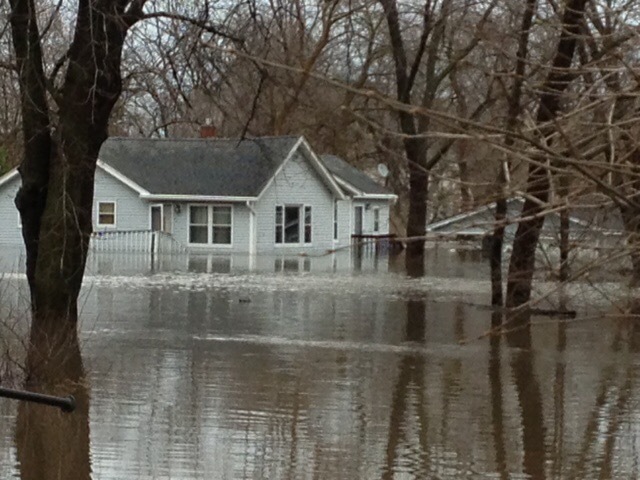 So we settled on a home not far from Lisle…on much higher ground. We are quite literally at the top of the hill. We have been working hard on our new home with the generosity and talents of family and friends. We hope to be living there very soon with just some finishing touches left. It is our dream home. We have poured everything into this new place with the plan that it will be our forever home. Every time I walk in, I see our HGTV fantasies come to life. We want to send out a HUGE thank you to all who have helped. You know who you are. And when I give the FIVE year flood update in 2018, hopefully all of my floodie friends will be as settled as we plan to be soon. If you want to read about THE FLOOD from the perspective of just a couple months away from it, read here. And if you want to read how it changed absolutely everything in our lives and how perhaps it was even a blessing, read here. And if you want to read last year’s update, read here. Are you aware that the house came down last year and the one north of it came down a few months ago? Prairie plants will go in soon. And there’s a new mayor and most of the board got the boot (1st election since the flood). Yes! Ours came down on St. Patrick’s Day I believe. Last time I was over there, north of us was still standing. I follow the Lisle WatchDog and the VOL on FB. We are in Downers now so still close.